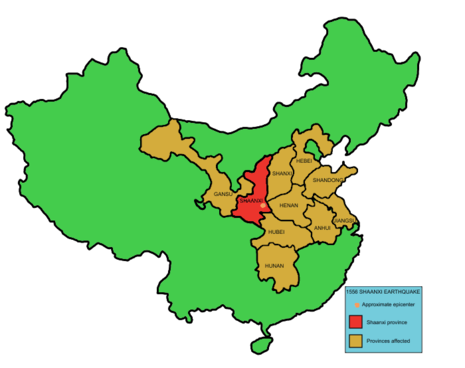 The 1556 Shaanxi earthquake or Jiajing earthquake was a catastrophic earthquake and is also the deadliest earthquake on record, killing approximately 830,000 people in China. It occurred on the morning of 23 January 1556 in Shaanxi, during the Ming Dynasty. More than 97 counties in the provinces of Shaanxi, Shanxi, Henan, Gansu, Hebei, Shandong, Hubei, Hunan, Jiangsu and Anhui were affected. An 840-kilometre (520 mi)-wide area was destroyed, and in some counties 60% of the population was killed. Most of the population in the area at the time lived in yaodongs, artificial caves in loess cliffs, many of which collapsed during the catastrophe with great loss of life. The Shaanxi earthquake's epicenter was in the Wei River Valley in Shaanxi Province, near the cities of Huaxian, Weinan and Huayin. In Huaxian, every single building and home was demolished, killing more than half the residents of the city, with a death toll estimated in the tens of thousands. The situation in Weinan and Huayin was similar. In certain areas, 20-metre (66 ft) deep crevices opened in the earth. Destruction and death were everywhere, affecting places as far as 500 kilometres (310 mi) from the epicenter. The earthquake also triggered landslides, which contributed to the massive death toll. The rupture occurred during the reign of the Jiajing Emperor of the Ming Dynasty. Therefore, in Chinese historical record, this earthquake is often referred to as the Jiajing Great Earthquake. Modern estimates, based on geological data, give the earthquake a magnitude of approximately 8 on the moment magnitude scale or XI on the Mercalli scale. While it was the deadliest earthquake and the third deadliest natural disaster in history, there have been earthquakes with considerably higher magnitudes. The death toll was unfathomable, an estimated 830,000 people died from what scientists estimate was an 8.0 quake. What factors contributed to such catastrophic loss of life? The quake was estimated to have destroyed an area 520 miles wide where 60% of population were killed. People lived in what were called yaodongs, artificial caves in cliffs that collapsed. The area is known as the Loess Plateau. Loess is the name of the silty soil deposited by windstorms from the Gobi Desert. Many of the population lived in the Yaodongs, or artificial caves which were destroyed by landslides caused by the massive 8.0 quake.